Recently I sifted through a box that turned out to be a treasure box because it yielded some great information about a recent ancestor. The ancestor was my father, George Rohrbach (1909-1999), and I was the one who had made the box. Let me explain. When my stepmother died in 2010, I helped clean out all her and my late father’s belongings. I spent hours going through drawers and boxes and bins, putting many things in the trash or recycling — Mom seemed to love nothing more than newspaper clippings — and also putting some things, not closely reviewed, in a carton to send to myself. This winter, as part of a long-term project to organize papers and photos, I opened the box and put the recycling bin nearby, certain I had sent myself some things to be discarded. 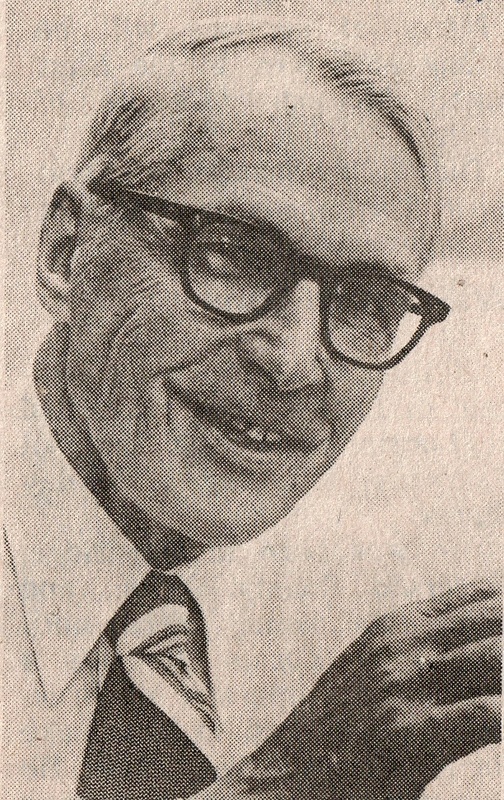 George Rohrbach, from one of the newspaper articles about his college graduation, 1983. Among some definite keepers — a rare photo of Dad at 18; his death certificate; clippings of his obituaries — I found some papers and clippings related to his late-in-life college graduation. Dad had quit high school to help support his family. When he was almost 60, he took the GED. He attended Baldwin-Wallace College part time and received a B.S. in geology in 1983, at age 74. Mom had saved all the clippings of the newspaper articles written about Dad — multiple copies, of course. I was tempted to toss them after reading them; after all, I was there and I remember it all well. But then I remembered that I have children. They weren’t born until after Dad graduated, and although they know he went to college as an older adult, they haven’t read of their grandpa saying, “Going to B-W made me feel like I was young again.” They will want to see all these papers some day, and so will Dad’s other descendants. Also retained from the box: clippings relating to Dad’s retirement, noting the forty-plus years he spent working for Ohio Edison Company. And the barbershoppers’ photos. Dad sang in a men’s barbershop chorus, the kind where the singers dress in garish outfits and ham it up. One year’s chorus portrait shows them wearing green vests and straw hats; another year’s, mustard-colored suits; another year, farm-themed outfits, with Dad in overalls. These photos are definitely keepers; not only do they tell a part of Dad’s story but they tell a story of twentieth-century America. I have spent so much time trying to look way back in my family history that I have to remind myself that the recent past, as recent as the 1980s, is also significant. Just the fact that I can remember something doesn’t mean that it’s not important for posterity. I say this to writers of family histories all the time, and I had to say it to myself. Thanks, Penny, for this wonderful reminder that the recent past can be lost if we don’t preserve it. Your father’s story is amazing–even if it didn’t happen hundreds of years ago. Penny – I would like to put the paragraph starting “I have spent so much time . . . .” in an electronic newsletter that I edit for the Summit County Chapter (Akron) of the Ohioo Genealogical Society. I would include a full citation plus a link to the full column. Do I have your/NEHGS’ permission. Hi, Howland — Of course you may have permission. Thank you for asking! Please just give a full citation, noting that NEHGS is the publisher of Vita Brevis. Especially those directly about your family, AND with date, day and paper name on it somewhere, of course. Because it is going to be a long long long time before images of Every American Newspaper will be up online via the LOC and the California papers project, etc. My family was not into this type of “scrapbooking” though often obituaries wound up with Mass cards and all were filed away somewhere, and my Mother had bits & pieces about my Dad on the WW2 home front. I myself never picked up the habit nor did my older sister. So when I recently ran several names through the recently canceled Google newspaper project (still online under Books, I think), the front page of a Sunday Bridgeport (CT) Post for September 1962 popped up with the front page story about my RN aunt as the city’s chief nurse. And I went, oh, I remember reading that, the other aunt having called to tell my Dad (her brother) about it. Now I have one item to include in that aunt’s genbio sketch. Should have had more. The current project for a friend was absolutely enhanced when she gave me a box of clippings her mother kept on her father’s engineering design career with Illinois Power. Between his service in both WW2 & Korea and his death, I had nothing beyond one line. Now I have an embarrassment of riches on his work/career. We should all be so lucky. And turn them into jpegs, too. Quite a Dad you had there, Peggy. What a wonderful box you sent yourself, and a wonderful reminder that the “stuff” we clearly remember needs to be saved for the next generations who won’t remember. I have a few newspaper clippings that my parents sent to me when I was living “away from home” for nearly 30 years. I saved these. Another treasure I was rereading the other day is a cookbook my father’s family put together in the mid 1980s, in honor of my great grandmother on that side. I didn’t know her, except through stories, as she died when I was one. She had 7 surviving children, though my grandmother died long before I was born. I knew well the 6 who were left, and the 5 “girls” were all incredible cooks. All were still alive at this time, including one who would live to be 101. This cookbook gathered their favorite recipes, and any that others contributed. It also included my great grandmother’s “sayings,” and I learned the source of many of the cheerful little cliches I’d heard around the house all my life. Best of all were the comments about the recipes that helped delineate the relationships between these women, to the third generation. What a treasure! The recipes are great reading, even if many are so heavy on Jello, Cool Whip, and cream cheese (often in the same recipe!) that our generation wouldn’t make them very often! Doris, those cookbooks can be such treasures. How wonderful that your dad’s family put the cookbook together! I have several organizational cookbooks of that era–as you say, full of Jello and Cool Whip. Was reading this last night while watching ‘Jeopardy’…..and “Lutheran glue” was mentioned after a question. I’ll bet there’s a lot of cream of mushroom soup in those recipes, too, esp. if they cooked for church suppers in the Midwest. (Don’t tell, but I still use it a lot). What a wonderful treasure to have! Love hearing about these collections from women. In the past, women didn’t have as many public outlets as men, so we poured our creativity into “home arts”, for lack of a better term. I’m always touched when reading about pioneer women who scratched patterns into their dirt floors to make them pretty, or saved scarce bits of wrapping paper or newsprint to cut into imitation lace to edge their kitchen shelves. My family are collecting photos of needlework; we have seven generations’ worth! Your recipe collection is exactly that sort of treasure chest, especially the sayings and comments. How lucky you all are to have it……made me happy to read your comment! You are so right, Robert–excellent advice. Thank you for commenting! Penny, thank you so much for your article on your “Dad File”. 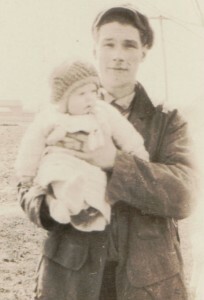 Today would be my father’s 109 birthday and, in two days, the 38 anniversary of his death. For several years, I would look at my materials on Dad and Mom and think “I need to do something to get this material in print.” Finally, this past summer, I finished a 157 booklet regarding the stories of my parents. They were definitely a part of the middle class, so my duty was make sure their memory would last. The booklet was a great joy and we even had a family reunion so that the booklet could go to each descendant. This week I am finishing a biographical sketch on my maternal grandparents, part of a longer project of writing biographical sketches of eacvh ancestor. Thank you for your article. It certainly opens the long range planning on those loved ones who have been gone for a much shorter time. Alan, thank you for posting. I am always happy to hear about people writing their family histories; later generations will be grateful to you! I would love to see the booklet. Do you happen to have an extra copy, or could you send me an electronic version? I often talk to family historians who are interested in writing, and I like to be able to show them samples of what others have done. Thanks! Great, Alan–thanks! My email address is pstratton@nehgs.org. We can only hope that our children will be as kind to our “stuff” as you were with your dad’s. I think that one of the reasons we are passionate about genealogy is that we all want to make these family members REAL to us, and to do that, we need to understand who they were, how they lived, and the times they lived in. A man who would invest his time in music, in dressing up in funny outfits, had humor and creativity in abundance in his life. How much more REAL is he. and will be to those that come after, now that this information is known about him? After all, finding meaning in the living of life goes so much farther than merely being born, bringing children into the world, and then dying, and is probably the driving force behind this marvelous quest we are all upon. You have articulated what is central to our motivations as family historians. Thank you! Thank you for kick starting my long over due project of writing about my dad. March 2 of this year will be his 104th anniversary of his birth. That day will be an ideal day to start his history. He was a loving, caring dad. He died at age 65, too young, but during those 65 years he influenced many people. He was a wonderful artist and shared his paintings with his family and friends. He also was an art director in several advertising agencies in Chicago. I think many people will remember Luther N. Johnson as a very kind, talented and generous man. Make photocopies of those newspaper articles on regular printer paper that is non-acidic. The originals will fall apart and yellow.